Male:sharp descending whistle. Female:whirring call. 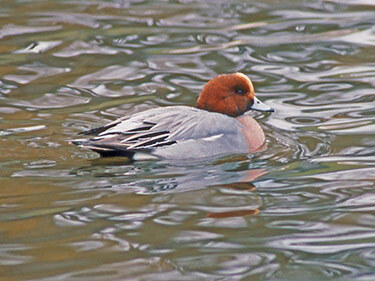 Description: Similar in size and pattern as American Wigeon. Male has dark rufous head and neck, with buffy forehead. Sides of body and back are pale gray. Body is finely-vermiculated gray. 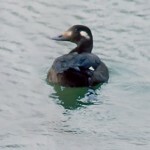 Appears much darker on water than American Wigeon. 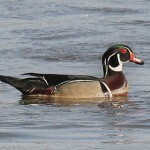 Habitat: Wetlands habitats, mixing with American Wigeons and other duck species. 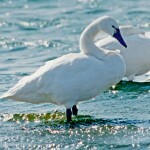 Where in Nebraska: A rare regular spring migrant in central Nebraska. A rare casual migrant elsewhere. Rare casual fall migrant across the state. Nebraska Seasons: Best time to observe is March through the beginning of April, most likely in the Rainwater Basins. Fun Facts: Eurasian Wigeons spend much of their time foraging in fields much like geese and hang around dabbling duck flocks to steal their food when they pop back up to the surface.